In the February/March issue of Tourist Attractions & Parks magazine, topics from Halloween events to popular food trends fill the pages. How waterparks keep safety a priority across the U.S. is the subject of “Waterplay Safety Tips for a Season of Fun.” A bonus sidebar discusses safety tips to keep guests from tripping. In The Buzz Boyz, readers find “A Report from First Quarter of 2017,” with industry experts Scott Borowsky and Frank Seninsky assessing the state of the industry. The Entertainment Center Report offers a company profile on Dave & Buster’s. “Striking Gold with Games – Building a Better Arcade at Bowling Centers” focuses on how arcades draw customers at bowling centers nationwide. And speaking of arcades, the article “Advice for the Best Arcades – Tips from Mini-Golf and Go-Kart Locations” discusses the ways in which arcade set up and maintenance can affect profitability for mini-golf and go-kart centers. “Presenting Ideas for Success: The Foundations Entertainment University Presenters” relates comments from presenters at a three-day educational workshop and seminar program. In “Shooting for Around-the-Clock Business – How Laser Tag Centers Are Serving All Customers,” varied clientele and additional profits and business are discussed. The Street Beat section includes “The Word from the Street – Coin-Op Game Operators Discuss the Most Popular Games,” an article on game popularity, market demographics, and top-drawing games nationwide. “Best Bets for Bulk Vendors – Candy and Prizes that Are Winners” discusses business-driving candy and prizes, while “Coin-Op Operational Strategies – Tips to Hire and Train the Best Workers” focuses on owners and managers tips to hire, train, and retain workers. The AAMA FEC Corner section includes “What’s Fun at the FEC – The Best-Earning Games and Most Popular Activities,” focusing on the popularity of FECs despite other family options. In the Amusement Rental/Inflatable News section, “Coping with Cost and Coverage – A Look at Insurance” presents insurance industry trends. The Haunted Attractions and Escape Rooms section features “Trends in Big Scares and Great Escapes,” offering a discussion of the challenges and chills at these attractions. An additional feature of this month’s issue is the Who’s Who Buyer’s Guide, featuring many of the top companies in the coin-operated game and laser tag businesses, from manufactured goods to professional services, with expanded listings featuring the magazine’s advertisers. 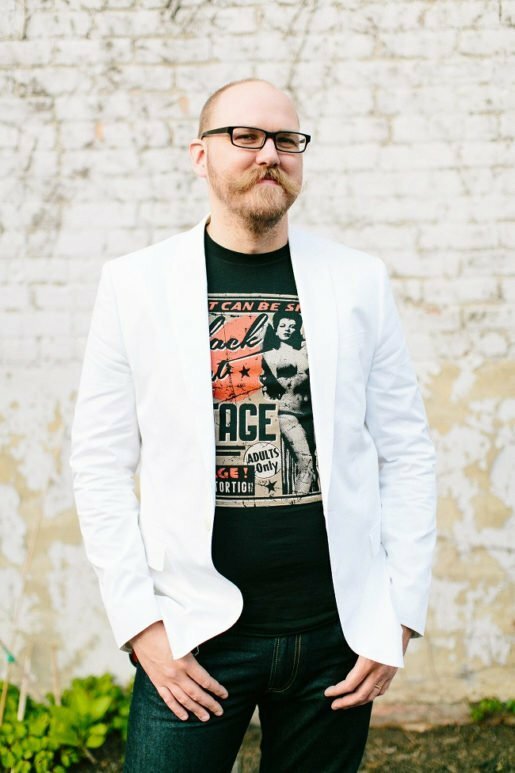 Derek Lindeman, one of five partners at Escape Room South Jersey, Collingswood, N.J. Escape rooms have become a popular entertainment choice. 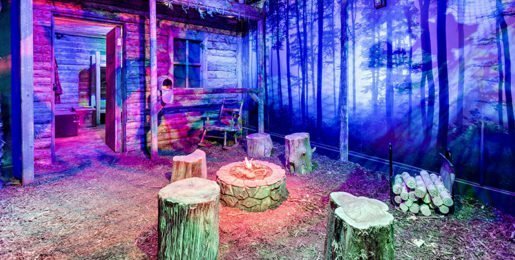 A rustic-themed escape room at an Escape Room Live location. The company has Washington, DC, and Alexandria, Va., locations. 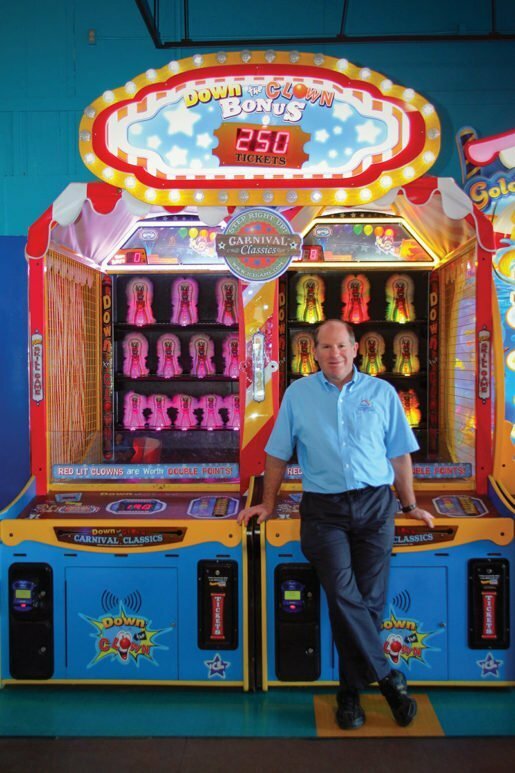 At family fun centers nationwide, arcades are big business. But how do FECs get guests excited about the games and attractions? 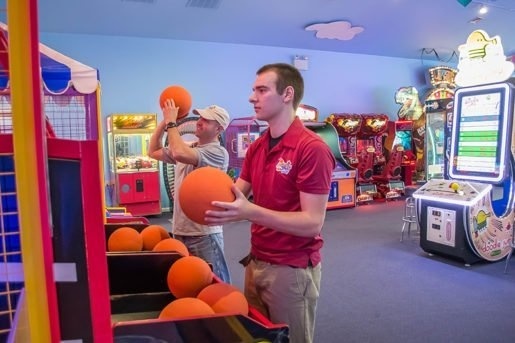 Fun center staff describe their top tips for getting guests interested in their arcades, and offer their take on the top attributes of a successful game room. In Wilsonville, Ore., Darren Harmon, manager of the Wilsonville Family Fun Center & Bullwinkle’s Restaurant, said one of the most important tools to employ in keeping guest interest in an arcade is changing the layout of the game room. “We do it three times a year. Keeping the arcade looking fresh is extremely important,” he said. “We also reinvest in the arcade every year to keep the games relevant. We constantly add new games and trade in the old ones.” Additionally, Harmon uses promotions to drive traffic to the arcade. “We do our $15 dollar Tuesdays which includes unlimited video games – that’s a big day for the arcade. In November and December we do what we call ‘arcade madness,’ and we sell our fun cards for use in the arcade as ‘buy $20 and get $20 free. That’s a great promo for us and a great deal for our guests.” To Harmon, the top attributes of a successful arcade are a clean and relevant game room. “Keep the game room operating at close to a hundred percent, and keep it as up to date as you can and as clean as you can,” he explained. At the All Family Fun Center in Las Vegas, Nev., Owner Lee Yarborough is proud of his excellent Yelp ratings and knows how he’s gotten them – “By being nice to people,” he laughed. “We honestly don’t have the most up-to-date games. We’re an older arcade, but we’re nice to folks, and that makes people want to come here. That’s how you make a successful arcade.” He added that after 35 years in business in the Las Vegas area, his arcade also has a reputation with people in the area for supporting children’s and charitable events. “We don’t have to chase that business, we have a reputation,” he explained. An additional technique Yarborough uses to sustain guest interest is the use of promotions. “We do packages, birthday specials, and specials for different days of the week, too,” he noted. Erik Peffley, facilities manager, with Jared Landis, staff member, playing a ball shooting game at Adventure Sports. The February/March 2017 issue of TAP includes extensive arcade coverage. 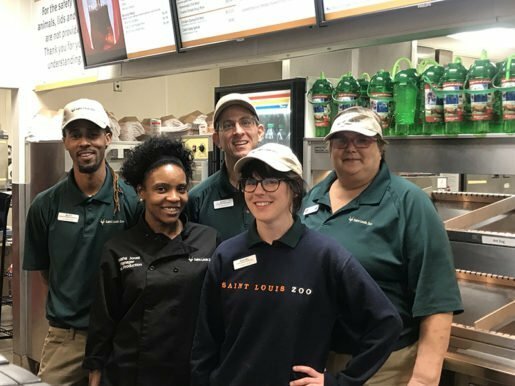 Saint Louis Zoo employees, from left: D’Juan Wiley, food service supervisor; Tanisha Jones, food production manager; Scott Trapasso, food service supervisor; Rachel Samsoucie, food service supervisor; and Sharon Woolford, prep cook. Fountain beverages and house-made snacks are profitable sellers for the attraction. Every year 81 percent of Americans celebrate Valentine’s Day by spending more than $25 billion on flowers, candy, jewelry, romantic meals and various gifts. And, a healthy percentage of that spending goes straight into Apple Industries’ Face Place Photo Booths. That’s where boyfriends, girlfriends, family and regular friends take and send each other digital photos, electronic photo “cards” and high-quality videos of themselves as Valentine’s greetings and mementoes. Major increases in the Face Place cashbox are becoming a Valentine’s tradition at Apple. For example, over Valentine’s Day weekend last year, Face Place cashbox earnings across the United States more than doubled on average. This year the romantic holiday period saw operators renew their Face Place love affair as cash boxes jumped 100 percent above a typical weekend’s earnings. What drives the revenue numbers up? Brand-new Face Place Valentine’s Day art and graphics such as photo frames, borders and themes, downloaded free to the operator of every networked Face Place unit running on the Smile 2.0 system. During the run-up to the holiday and on February 14 itself, as soon as a customer enters the booth and begins using the touchscreen to format their pictures, Valentine’s-themed borders and art automatically pop up as the first option. It’s a great reminder to create a Valentine photo and help encourage customers to spend more and share more images to more friends and family members. Craig Platt of the Santa Cruz Beach Boardwalk Casino Arcade. Photo by Wai-Ling Quist.